On Saturday the 14th of July I went to the musical Wicked with my parents. I had really been looking forward to this show as I had some raving reviews on the West End version. Needless to say, the Dutch version would undoubtedly be a little different, but usually the Dutch adaptations are very good as well. I really thought it was highly impressive and it immediately grabs your attention. The rest of the decor that is used during the show is subtle without too many embellishments. The plot of the musical relates the story on how the girl Elphaba became the Wicked Witch of the West. I really do not want to give anything away on the plot, because it is very well thought out and because I think people will be able to enjoy the show more if they do not know the entire story. Just prepare yourself for a few very interesting twists! 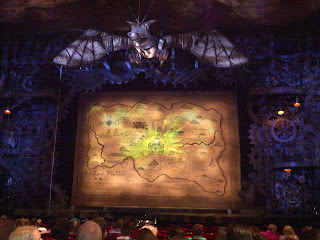 :D Though I would strongly advice against taking children under 9 years old to this musical, as some parts are rather frightening. The Dutch cast did a very good job. On Saturday Celine Purcell, the understudy of Chantal Jansen, played the part of Galinda (or later Glinda). A few years ago I watched her perform the part of Eliza Doolittle in My Fair Lady, and was not at all impressed. I really did not think she was a convincing Eliza and her singing was lacking in many respects. So needless to say I was a little weary when I discovered that she would fulfill the part. I have to admit that I was pleasantly surprised. She really grew in both her acting and her singing. Not once did I detect that she missed a note or anything of the sort. So I expect to see more things from her. Another member of the cast was Jim Bakkum. He took second place in the first season of Idols here in Holland. To be honest, I did not really like his voice as I thought it was too nasal and with that too boy-band-ish. However, here too I was in for a surprise. His voice has greatly developed: it is far less nasal and has moved much more towards the deeper, rounder musical voice which we all love. He is not entirely there yet, but he sure is getting there. So I look forward to seeing him develop in further musicals. Last, but definitely not least, there was Willemijn Verkaik who played the wonderful Elphaba. My gosh that woman can sing!!! She leaves all the other cast members to bite her dust. It is definitely the best Elphaba that I have heard so far (yes I have been searching youtube to listen to the song lol). Unfortunately, the Dutch producer has decided not to bring out a cd of the Dutch musical version (*shakes fist at Joop van de Ende* HOW COULD YOU DO THIS TO US FANS!!!! T_T), so I have added a youtube video which shows her performing the song Defying Gravity (in Dutch: Ik lach om zwaartekracht) at the Musical Sing-a-long, which is an event that takes place once every year during the Uitmarkt (a cultural event). So yes I would definitely recommend this musical to anyone who likes musicals. Though be warned all you men out there: it is a bit of a chick musical ;). I totally agree with your review! And I very much like the way you give credit to Céline and Jim. And Willemijn... tja, gosh what a voice.